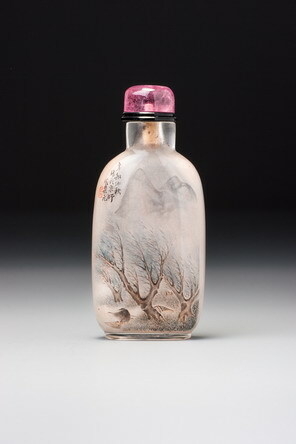 There is one subtle variation here on the simple superimposition of flat panels on a basic form: the narrow side panels have been made slightly concave, making them lighter in feeling and adding elegance to the overall shape, a common device on this form of bottle, certainly from the mid-Qing period (see, for instance, Sale 3, lot 67, dated to 1797) but also perhaps before or after. It would be perfectly reasonable to see this as another form inspired by the European pocket-watch. Bearing in mind the popularity of these European imports at court and the influence they had on a variety of arts, we could be forgiven for assuming that this was probably copied directly from a watch. Eddie Chow (1910 – 1980), the famous Shanghai dealer and collector who retired to Geneva in the final years of his life with one of the finest collections of ceramics and other Chinese works of art in the world, was renowned for his excellent taste and broad knowledge of Chinese art. 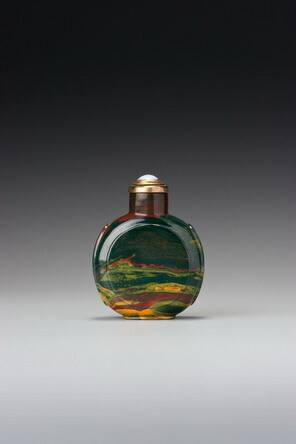 He had a small collection of snuff bottles, and each was of top quality within its field. This is no exception. Apart from its formal strength and quality of workmanship, the material is spectacular, with vivid colours and evocative markings.